Last night I went to see Little Barrie (with a Japanese Fan Site too) and Big Strides at the Liquid Room in Ebisu. I really liked the Liquid Room. It reminded me a lot of the Mercury Lounge in NYC, a place where I've seen a lot of great shows. It was about the same size, perhaps a slightly larger stage area, and a nice lounge area up on the second floor (separated from the live music venue though.) 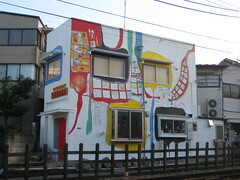 I plan to go there more if possible, it is one of the nicer venues I've been to in the Tokyo area. I really enjoyed Big Stride, but that could be because they have an upright bass, which is really interesting. No frets on those things, and they are massive. Just huge. Penn Jillette plays one of those things, and I really enjoyed his radio show podcast when it was still on. 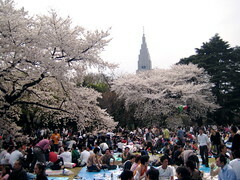 On Sunday, April 1st, the weather suddenly became beautiful, despite earlier predictions of rain. My friend Risa and I decided on the spur-of-the-moment to head over to the Shinjuku Gyoen National Park (新宿御苑) for some Cherry Blossom Viewing. 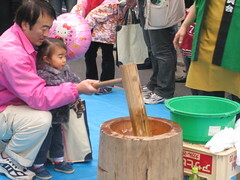 It is hard to think of anything more traditionally Japanese than a good old-fashioned Hanami, and we certainly weren't the only people with that idea. The weather was just beautiful, the day started out a comfortable and sunny 23 degrees Celsius, but after a while sitting in the park started to get a bit warm. We picked up some Bento lunches near Shinjuku station, and then some drinks (of course, Nihonshyu is a required drink) before going to the park. After about ten minutes waiting to buy tickets to get into the park (only 200 yen for adults!) we headed in and looked for a place to sit. It was pretty crowded, but we got there at about 11:30am, and was much less crowded than when we left at about three or so. 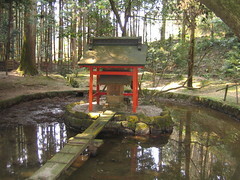 We found a reasonable place to sit, sat down and enjoyed our picnic lunch and some loverly beer and sake. With the cherry blossoms falling around us and beautiful weather, it was a great little lunch. 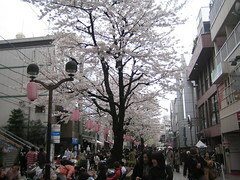 The other day, while walking home from Jiyugaoka, I was struck by how pretty the Sakura were on the main shopping street. 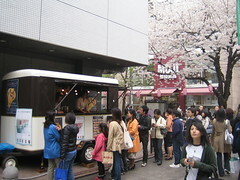 I snapped a few pictures, and of course since the weather was nice there were lots of people lined up for Crepes at the cute little crepe stand. 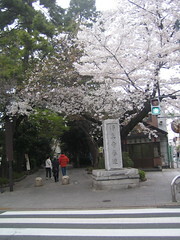 There were also some nice Sakura out by the Kuhombutsu temple main walk. 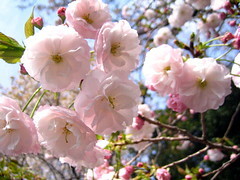 It is really amazing that these Cherry blossoms only last for about a week. You're pretty lucky when the weather is nice and they are in full bloom. After the Japanese Natural Language Processing Conference, I had a few hours before returning to Tokyo, so I went to the nearby Ishiyama temple, which is said to be where the Japanese author Murasaki began writing the Tale of Genji. 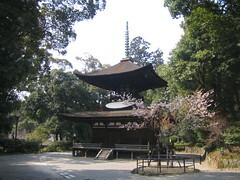 It is a really beautiful temple, with very large grounds and nice areas in which you can walk around. On the way back I walked past the Seta Karahashi bridge (also shows up in some old folding screens and some other nice pictures) before getting on the JR line to Ishiyama and catching the Shinkansen from Kyoto to Tokyo. Resynthesizer is an amazing plugin for the Gimp, an amazing open-source photo editing program. Since I usually run OSX, I like to use Gimp.app, but it does not include the Resynthesizer plugin. Gimpshop, a version of Gimp modified to be more like photoshop, is supposed to include Resynthesizer, but the version that I downloaded did not seem to have it. So I've decided to try to build the Resynthesizer plugin from source to see if I can use it in either Gimp from fink, Gimp.app, or Gimpshop. Excerpt of translation by Morgan G.
A few weeks ago, I finished reading Wataya Risa's second novel, 『蹴りたい背中』 ("The back I wanna kick"). For me, it was a minor milestone: it was the first Japanese novel that I have read in Japanese. I've studied the language for about seven years on and off, but since I'm a compute scientist by trade Japanese isn't something that I've focused on. Now that I'm living in Japan, a lot of what I do at work is in Japanese, and I thought it was important to try to improve my proficiency with Japanese. On Benkei's suggestion, I started to read his copy of Keritai Senaka. It took me a long time, but I finally finished it. Now I want to give a review of the book. In all honesty, I was quite surprised because I was not impressed with the book. It won the 2003 Akutagawa Prize for literature, so I was expecting great things. I've since heard a lot of talk about the prize being engineered by publishers as a public relations move. In 2003 the winners were both very young, 18 and 19 I believe, and cute young women, which publishers felt would interest youth in reading. I believe that they did get some positive effect from that move, but I was still disappointed with the book. As part of a societal cultural research learning field trip, Benkei and I went with a friend of his to the Pinafore Maid Cafe. We went on a Wednesday evening, in the rain. This actually turned out to be pretty important, but more on that later. I went to and wrote about Maid Cafés in Japan once before, but that was an individual trip, I went on my own, alone. This time, I was going in prepared, with comrades and advanced information: According to Benkei's friend K, we were going to one of the most representative Maid Cafés in Akihabara. The place was actually pretty small, and quite busy so we had about a half hour wait before we were seated. The Maids were all very cute (a prerequisite for working there?) and very polite, to the point that I might need to study more honorific Japanese to understand the conversations completely. The food was slightly more expensive than what you would find in a regular café, but not unreasonably expensive. The menu was quite heavy on the desserts, but the meal section was a bit sparse, with perhaps five major items. The most popular item (I presume) is the "Loving Omelette Rice", which is regular Omelette Rice where the Maid writes something on the Omelette in ketchup for you. Of course, you are allowed to choose what the maid will write, but the picture in the menu is "LOVE", with cute hearts around the side of the plate. A very cute dish. I think the idea of writing on your food, giving it a semantic meaning and clearly-defined role, is a great one. I asked that the Maid write "栄養" (nutrition, nourishment) on my rice. She seemed a bit daunted (she was actually a Maid-in-training) but wanted to give it the old college try, and decided to write the Kanji characters. Unfortunately, she was a bit off and wrote something that looked more like "労良" (not a Japanese word, but maybe "work, labor, good"). Honestly, I probably wouldn't have noticed the difference, but Benkei's got a keen eye, and picked up on it immediately. K asked for the Maid to write her name, and the Maid, somewhat shaken by her earlier missed attempt, used incorrect characters for the name as well, but Benkei didn't say anything until after the Maid left. Still, I was impressed: I always thought that the line on Japanese youth today is that they can't write Kanji at all, and what I asked for is a fairly difficult word. One of the interesting things about the place was, of course, the clientèle. There were a lot of people that seemed to be the classic Otaku, loners who looked a bit shy and lonely, and who positively lit up when the Maids talked to them. I can understand how targeting that demographic could be lucrative, as they might develop a fancy for a favorite maid and become regular customers. Surprisingly though, there were also some groups of very normal looking people, a salary-man or two, and a few women in the café. I'm beginning to think that Maid Cafés in Japan are just a kind of mini theme park, or some sort of Las Vegas theme microcosm. As we checked out, we were told about the point system. They have a point card that accumulates points based on how much you spend. There are various multipliers that can increase the number of points that you get. We hit two multipliers on this trip: it was raining outside (x2 multiplier) and there was a female in our party (x2 multiplier, which is a very revealing one!) Because of this, my card filled up to about 20 points. At 15 points you get a laminated card with a Maid character (anime style) on it, and at 30 points you get another card and you can take a picture with a maid. I didn't mention it, but all of these places have very strict prohibitions against photography. They use the promise of photographs as a reward for return visits! Another avenue towards profitability. Since Benkei was going back to America, and K didn't seem too excited about going back to the café I got the point card by default. A friend of mine from the US, Panos, went to Hiroshima to give an invited talk for a conference and then came to Tokyo for three days for a visit. Since we both went to Columbia together, he called me up and we decided to get together for dinner on Monday night. Panos has come to Japan a few times previously so wasn't interested in the usual tourist options, but when he said that he was staying close to Akihabara, I knew I had to take him to the unusual Maid side of Tokyo. I took him back to Pinafore, and we had dinner. This time I also got a 4x point multiplier (2x because it was raining again, and 2x because it was a weekday and we finished our stay within 60 minutes) so I collected another laminated maid card and a card for a picture with a maid if I ever go back. I thought it would be nice to get a drink after dinner, so I did some searching to find interesting places in Akihabara. I had heard about a bar where you go and can play games of chance with the Maids (yep, another Maid themed place) like paper-rock-scissors to get a possible half-off the drink price, but it seems like that placed closed down. Too many customers getting drinks for half-price? People really love paper-rock-scissors here, so it is possible. A quick search turned up a crazy number of maid-themed places. There are even maid cafes in Roppongi and Ginza now: they are spreading out beyond Akihabara. There was a place that looked very interesting though: the witch bar unattico-sttrega. We went there and had a few drinks. It was a fairly nice bar that was like any other bar, except all the bartenders were cute women dressed up like witches. Which is somewhat surreal, but that is Akihabara for you. There were only six customers, two Japanese men at the bar, the two of us, and then later on two women came in and sat at a table. There was a 600 yen charge for sitting at the bar, and 300 yen to sit at a table, and then the drinks which were a bit expensive. We had some sake, and then since each Witch has a special cocktail, we each had one of the cocktails. One of the witches was complaining that she hadn't made her special cocktail in a while, and had forgotten what it was! They both turned out quite nice though. After that Panos and I parted ways, since he had to catch a plane back to New York the next day, and was dead tired. Sadly, he will probably be about adjusted to the time difference tomorrow, when he leaves, and then will have a crappy week back in the US as he tries to re-adjust to US time. One week is just too short of a trip to get used to the time difference well. I think Panos had a good time, we certainly had a lot to talk about, but now I feel a little bad about introducing odd aspects of Japan to tourists. I always worry that the Western media only picks up the strange and unusual stories from Japan, ignoring the many similarities there are here with normal city life. Still, those few unusual stories are quite interesting. I'm not sure when or if I'll go back to a maid café, but I feel like I should at least go back once to use up my picture card. Ever since I came to Japan a year ago, I've wanted to get some sort of display device that was HD-capable and larger-format than the 15" display on my ThinkPad A31p. Generally, I only watch a little bit of TV, some NHK news in the morning and evening, but I watch a lot of TV shows from the US downloaded off of the internet, and a fair number of DVDs from the local Tsutaya rental shop. So for me, an ideal solution would be something that can work as both a monitor and a TV, and the TV part isn't all that important. I've been thinking about this for quite a while, and I finally decided on the IO Data LCD-TV241XBR monitor. There are a few other monitors that are the same size that are a bit cheaper, but what really sold me on this monitor is that it has an internal analog TV tuner (and speakers) as well as a remote control. It is a drop-in replacement for a TV, and also has an analog computer input (DB-15 D-sub thing that can drive the monitor at 1920x1200) as well as a DVI digital input, a D4 digital input (whatever that is, some form of HDTV pre-HDMI connector) and a regular SVHS connection. This is an update to a previous post on simple referrer tracking. The original code is from justinsomnia.org. I was playing around with the referrer tracking code I use here over the past few days, and made some minor adjustments: I use a DHTML slider to set the range of days over which to track, and I allow you to choose to get a count of the unique referrers or requests. There is a max limit of 365 days, but that is totally arbitrary. Maybe I shouldn't have used a DHTML slider, but I thought it looked cool. I guess I could also change it so that "365" means "all days" too. But I won't do that right now. For the first time in my life, I have actually read an entire Japanese novel. I personally feel that it is something that I should celebrate, but I have to say that I am a bit embarrassed to say that it has taken me about a year to actually read this book. The book is Wataya Risa's a back I wanna kick" (please forgive the crap title translation). Wataya Risa is an interesting author - she won a literature at the age of 18 and has been somewhat of a phenomena with her first book "Install" and now this one. Anyway, I borrowed the book from my good friend Benkei, whose Japanese is just excellent. I also got a nice Japanese vocabulary sheet for those difficult words, but sadly his vocabulary is better than mine so I still had to look a lot up. Even though I really like reading, I spend a lot of time at work reading and writing Japanese email and talking to people in Japanese, so when I get home I really don't want to read Japanese literature. I just want to read some easy English stuff, or maybe listen to some English TV or something. So just about the only time I ended up reading this book was on slow weekends, when I had enough time to walk over to Jiyuugaoka. I would have lunch in a cafe, usually Excelsior, and spend an hour or two reading. I probably went once or twice a month over the past year. Eventually, I really came to like this custom. Unlike English books, which I can read stupid fast (but not remember anything about afterwards) I had to take this book slowly. Even if I only get through about ten pages in an hour, it really felt like I had accomplished something. I also enjoyed observing my cafe surroundings. One of the results of my year-long observation is that if you see a foreigner in a cafe, it is 95% likely that the foreigner is a guy with a Japanese girl, and they are having some sort of English lesson. Cafes are the new English Conversation Class. I don't really think this is a bad thing, because you can get some nice coffee, relax in reasonably open space (compared to small Japanese "mansions") and not worry about intruding on your partner's personal space. Still, it is kind of funny. Today, I was pretty sure that I would finish the book since I only had about ten pages to go. I was pretty excited about it. As I ate my usual four types of cheese and four types of mushroom panini sandwich with hot chocolate, I leisurely read. Next to me was a group of (the usual kind) of high school (maybe?) students trying to look older than they are, with overly fashionable clothes (not their school uniforms) and too much makeup chattering on and ostensibly studying math. As they started to talk about moving to a new place, one of the girls looked over at me and said "No way, he's reading kanji" or something like that. I didn't hear much after that, since they lowered their voices a bit, probably worried that the now-known-to-be Japanese speaking foreigner next to them might hear, but I did hear "American" a few times. Things like that would happen every once in a while. Well, even though someone said that I can read Kanji, I don't really think that means that I understood everything. I'm still not really sure about that book. Did I even understand the point behind the whole thing? I could kind of, and then again, not, relate to the main character, an isolated lonely girl named Hatsu, but I'm not sure that I really understood what was meant by "that back that I want to kick". In the end, I think she liked the nerdy Ninagawa character, but I'm just not really sure. I don't know if it is a problem of the Japanese language (probably not, since I understood the majority of things) or a problem of a difference in cultures, which I think is more likely. Well, in the end I'm really happy that I was finally able to read this book. I think it's a great achievement for me on my own personal scale. I'm a bit worried about what will come of my beloved habit of reading in Cafes now though, since I don't have a Japanese book to read anymore. I wonder if I'll be able to find another good book that I can understand and like enough to finish reading? I read a few blogs, and an interesting post over on What Japan Thinks about a survey on crime in Japan (and how foreigners are a large contributing factor) pointed me to another very interesting post over on Debito.org on a Japanese magazine about foreigner crime. It is definitely worth taking a look at both posts. Arudou Debito's site, Debito.org is quite interesting, but not generally something that I read often. He's a guy who has lived in Japan for quite a while, gotten citizenship here, and often posts about issues relating to foreigner discrimination in Japan. I'm not particularly interested in that: I know that there is discrimination here, but for the most part I accept it, and I think that mostly it isn't done with malice. It is just that Japan is a fairly homogeneous country, and many people are not used to foreigners. It is natural to be wary of what you don't know, so I try not to worry about it too much, and when the foreigner effect goes against me, I try to laugh it off. The recent post about a magazine that is basically about crime in Japan by foreigners is a bit disappointing though. I also don't put too much weight into it, because sensationalism sells, and it only takes one or two people with a bad idea to actually get something published. How close did the OJ Simpson confession book come to being published in the US? That's clearly a bad idea. So I think in this case you probably have a book that not many people are buying, or at least taking seriously, that is getting a lot of attention because it is so offensive to foreigners, but I would hope that most people wouldn't outright agree that foreigners are ruining this country. Of course, the post over on What Japan Thinks says that maybe that isn't the case so much. Would a similar poll in the US about crime point the finger at largely foreign groups? I don't think so. But I bet you there would be controversy over groups of people with low economic income or race. Is that similar though? Certainly I think crime is more likely to be committed by people who are desperate, and being poor is a good way to get desperate quick. You can argue that Americans have an institutionalized system in place to keep the poor poor and all sorts of things from there, but it somehow feels a bit different from the blame that foreigners get in Japan for crime here. Now I'm interested in seeing what the statistics are on actual crime committed in Japan: do foreigners commit most of the crimes? Well, I don't really know where I would go to look those numbers up, so I'll just have to continue on hoping that this here is nothing more than a storm in a teapot. Still, interesting reading. Since Debito's original blog post in early February, after about a week or complaints to Family Mart (one of the stores in which the magazine was sold) sales of the magazine were halted. You can also read a translation of the publisher's response to criticism about the magazine. Today is one of my favorite days of the year. The day after Valentine's Day. Cheap Chocolate Day. When I stopped into 7-eleven this morning for my morning yogurt and bottle of lemon water, they were running 50% off of their Valentine's Day Chocolate. 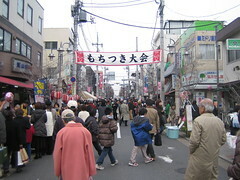 Valentine's Day is pretty big here in Japan, even more so than in the US I would say. In the States, it is really a lover's holiday, and probably there are lots of sales of diamonds and necklaces. Here in Japan, it doesn't seem promoted as much as a lover's holiday, but the chocolate companies really know what they are doing. 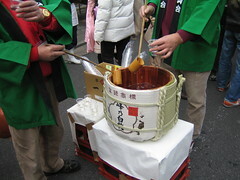 They have somehow introduced the idea of giri-choco (義理チョコ), or "obligatory gift chocolate". I'm not really sure if that was something that the chocolate companies came up with, or in some roundabout way happened because in Japan Valentine's Day is for women to give chocolate to the men that they like. I could imagine that in high school or much before, shy girls would be too shy to give only chocolate to the one boy they liked, and instead gave chocolates to every boy, kind of like how in elementary school everyone in class exchanged valentine's day (cute little playful) cards with everyone else so nobody felt left out. Then that somehow continued on up into the workplace, where it is normal for the women to give their bosses and co-workers chocolate. I have heard though that if you are the real sweetie, then you get hand-made chocolates, while everyone else gets store-bought chocolates, so maybe that is how the secrete message is actually communicated along. It very well could be the chocolate companies though, since they also came up with White Day, a holiday on March 14th (one month after Valentine's Day) where men give chocolate to the women that they like. I haven't heard about giri-choco for White Day as much though. Actually, yesterday in my office I bunk with a couple of foreigners. They are in the Honiden Lab research group, and the two secretaries for the lab gave them all chocolates. (None for me though!) That is giri-choco at work: at least one of the secretaries (probably both though) are married! So anyway, Valentine's Day in Japan is interesting. It sounds very expensive if you are a female secretary with lots of male members in your group. As for myself, I did find some chocolates on my desk this morning, and combined with the half-off cheap chocolates I got myself, I had two valentines! Yay! I wonder how long the 50% off sale is going to last on chocolate around here. Man, I love the day after Valentine's. 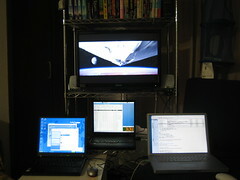 I've been quite busy lately, but yesterday I threw on "Robotech: The Shadow Chronicles" while I did some work at home. I was a big fan of Robotech as a kid, I watched all three series, and of course didn't realize that it was a mish-mash of three different anime brought over from Japan. I was quite surprised to see that there was a new movie made, so I was interested in seeing what it was about. I didn't pay too much attention while it was on (I was doing work, after all) but I was really confused. I haven't seen any Robotech since I was a kid, and this thing just jumped right in and continued the story from the last show of the US cartoon. I didn't know who any of the characters were, but had some vague memories of the characters. If you are a Robotech fan, I recommend it. If you aren't, I'm afraid you will just be confused. If you watched the show as a kid, you will probably enjoy it like I did, but be confused. And boy, that scientist was annoying. I have installed LaTeX via fink, and when writing a paper, came across the problem that Japanese just does not work in my environment. This is a bit of a problem as I'm writing about some analysis of English, Japanese, and Chinese data. So I'm going to try to get Japanese input working in my LaTeX distribution. I found myself needing to do some Japanese morphological analysis today, which usually means either Chasen or Kabocha. Kabocha is supposed to be the new hottness, running fast, but a quick search didn't turn up any precompiled packages for it on OSX. ChaSen, on the other hand, is available in DarwinPorts, but since I went with fink, and just want to get something running, not enter into some sort of strange package-management land-war, I skipped that. It also turns out that apple is hosting an package for chasen. It install with a nice installer into /usr/local/bin/chasen. Details follow the read more link.